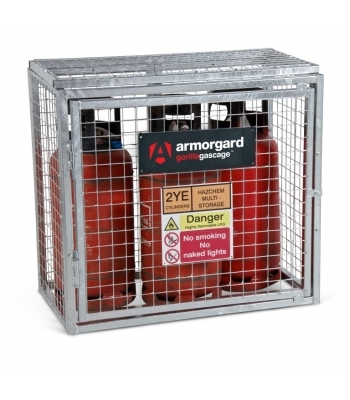 Gorilla gas cage 1000x500x900, Unique, modular, bolt-together gas cage, designed for the safe storage of gas cylinders. Heavy-duty construction using 30mm box section and 3mm wire mesh maximising the strength and durability of the product. Comes with a hinged door and padlock facility for security. Has the facility for bolting the cages down to the ground, which is brilliant for a fixed installation requirement, providing extra security and stability. Comes complete with all fixings and relevant signage to comply with regulations on storing gas cylinders. Galvanised finish to sustain all weather conditions and provide maximum usability and durability. 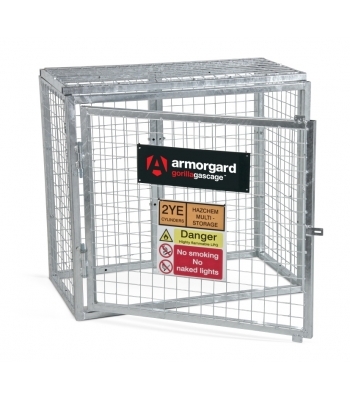 Modular design allows the cage to be erected quickly and it can be made to any required size. Can be easily dismantled when not in use and stored away tidily as individual panels.